Located in the heart of Brooklyn, New York, Lenox Academy offers an academically accelerated program for middle school students in grades 6 through 8. Yet, while the overwhelming majority of our students exceed New York State standards in English Language Arts and Mathematics, a deeper analysis reveals a disturbing trend. We discovered that as the curriculum became more challenging over the course of middle school, many of our high-achieving students retreated from putting forth effort. The result was that academic performance actually declined over the three years for a large number of our students. Reading about the work of Dr. Carol Dweck and her team at Mindset Works, we were able to more clearly understand the nature of our dilemma. Students who retreated from putting forth effort, we now realized, were exhibiting the characteristic fixed mindset. These were students who, for the better part of their young lives, had been praised for intelligence based on their performance in school and on NY State standardized exams. Acceptance into Lenox Academy brought more praise for intelligence—but when the accelerated curriculum began to present the kinds of challenges they had not previously encountered, they retreated. In order to engage teachers in implementing the program, we initiated an email campaign to introduce the program and the rationale behind piloting it with our incoming 6th grade class. We shared the monthly Growth Mindset Digest and forwarded articles as well as links to the teacher resources found on the Brainology website. We scheduled quarterly grade meetings where we brought teachers up to speed regarding instruction and the learning activities in which students were engaged. At these meetings we discussed ways of infusing the ideas, concepts and skills learned in Brainology across subject domains. We also collaborated in developing strategies we could employ to ensure that all teachers were fully engaged and understood the shared responsibility of succeeding in creating a Growth Mindset school culture. 1. Am I a learner? 2. How does my brain work? 3. How does learning change my brain? 4. Can I grow what I know? 5. Am I persistent in solving problems? 6. Do I seek or avoid challenges? 7. How do I know I am doing my best? 8. Is this an opportunity to learn? 9. Why are mistakes wonderful? 10. Do I have a growth mindset? We posted these questions as banners hanging in the corridors and teachers posted them in their classrooms. We agreed that these questions would serve as entry points into conversations with students about performance on assessments, observable work habits, and general behavior. Each of the 10 essential questions was unpacked in our Character Development classroom where students discussed and reflected on each question in depth. In order to hold each other accountable for following through on this commitment, we created a Growth Mindset bulletin board in the main office. Each time a teacher interacted with a student using one of the essential questions, the brief conversation was documented and then posted to the bulletin board. This Growth Mindset display grew during the year and was seen by teachers, students, administrators and visitors. 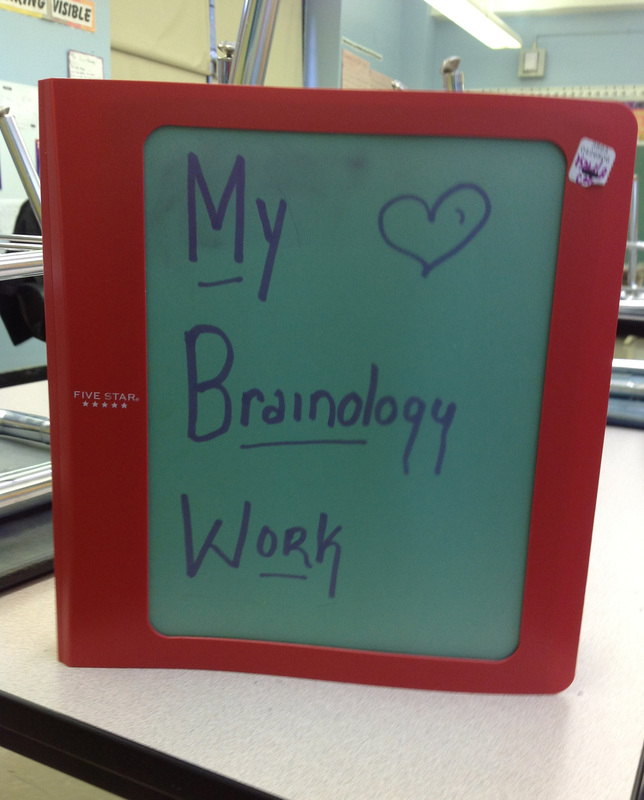 Each student created a Brainology binder consisting of all assessments, tasks, and reflective pieces associated with their work in Brainology during the year. We decided to supplement the activities and assessments embedded in the Brainology curriculum with reflective writing assignments that we administered three times during the year. These reflective pieces presented students with an opportunity to revisit the various ideas, concepts and skills associated with the Brainology program. They also proved valuable to teachers and administrators, serving as evidence of student learning. In reviewing student responses we were pleased to see that all students were using the language of the Brainology curriculum. While almost all students saw growth in their quest to develop a growth mindset, many recognized that there was still much work to be done. 1. Teacher praise for effort: Many of the students were able to articulate that they had come to understand the difference between praise for intelligence and/or talent, and praise for effort, persistence and perseverance. 2. Using the language / changing the culture: All students used the language, ideas, skills, and concepts of Brainology in response to our prompts. 3. Gaps: Students identified and acknowledged personal gaps and work yet to be accomplished in order to fully develop a growth mindset. 4. Transition to Middle School: Many students mentioned the transition from elementary to middle school and how difficult it was at the beginning of the year becoming accustomed to the rigorous curriculum. They acknowledged that they had acquired a fixed mindset in elementary school and how the knowledge and skills learned in the Brainology program helped them to begin making the transition to a growth mindset. A brief discussion ensued with 6th grade teachers sharing their personal experiences and conversations with students around the Growth Mindset ideas and essential questions. Teachers themselves were very candid in self reflection, admitting that they, too, had moved toward developing a growth mindset this year. 1. Growth Mindset: Redefining what it means to be smart as possessing and demonstrating a growth mindset: persistence, perseverance, learning from mistakes, embracing challenges, and putting forth effort in achieving goals. 2. All about My Brain: Learning about how the human brain works based on current advances and discoveries in neuroscience. Each and every student was genuinely interested in learning about his/her brain. 3. Growth for Life: Internalizing the skills and knowledge acquired in this program to become industrious, productive, life-long learners. "If you want to make small improvements in an organization then you focus on changing attitudes and behaviors. If on the other hand you want to make quantum improvements then focus on changing paradigms. Attitudes and behavior will follow." As we begin a new school year, we can look back at our work and know with confidence that we have begun to transform the teaching and learning paradigm at Lenox Academy—and we know that we are poised to move forward by making improvements where necessary while building on our successes. Joe Giamportone has been Assistant Principal of Lenox Academy for 7 years, and a science teacher for 11 years. In his previous career, he spent 15 years as a restaurateur. Mindset Works is an organization co-founded by Carol Dweck and colleagues with the goal of instilling and supporting a growth mindset in our students, schools, and culture through programs and resources for students and educators. Visit us at www.mindsetworks.com to learn more and to subscribe to our free monthly Growth Mindset Digest. Copyright© 2012 Mindset Works, Inc. All Rights Reserved. Great post. We are just introducing brainology and growth mindet with our Y8. Would be great to connect. Good day, Steve. Trust all is going well. Thanks for the comment and yes, feel free to contact me at any time via email jgiampo@schools.nyc.gov. Let's exchange ideas and look for ways to connect our students. Great article Joe. I like a lot of the ideas that you used to get the most out of the program, teachers and students. We have just run a very small trial with some indigenous students in our school but I am looking at ways to expand it. Embedding it into the science curriculum seems like a good way to go. I will refer back to this article for its wealth of ideas. What a thrill to read of your growth mindset undertaking with your students. You lit a fire under me with your reference to indigenous students. Not only am I passionate about getting growth mindset learning throughout Australia, I've a special interest in indigenous students having studied indigenous culture (Aust) etc for two years during my degree. It is so inspiring to read about teachers who focus on educating children about enjoying the process of learning. I wish there were tools for parents to promote the principals of growth mindset in academically not motivated kids.